"The majority of public discussion regarding makerspaces to date has focused on particular projects, skills and equipment, as opposed to collaboration, student agency, and broadening participation, which ultimately have a greater impact on learning and life outcomes. They form the foundation of a program, and neglecting these cultural elements may have unintended consequences, such as excluding young women and other groups underrepresented in science and technology" said ExCITe Center Director Youngmoo Kim, Ph.D., a co-author of the study. "To develop the next generation of innovators, makerspaces must be welcoming and inclusive to all students". The report was co-authored with Drexel School of Education researchers Kareem Edouard, Ph.D., Katelyn Alderfer, and Professor Brian Smith, Ph.D.
"The implicit bias revealed in Making Culture confirms for the education community that access to makerspaces is not enough to meet our goals of equity and inclusion. More work must be done to support diverse and broad participation." said Kareem Edouard, Ph.D., postdoctoral research fellow at the ExCITe Center and a co-author of the report. 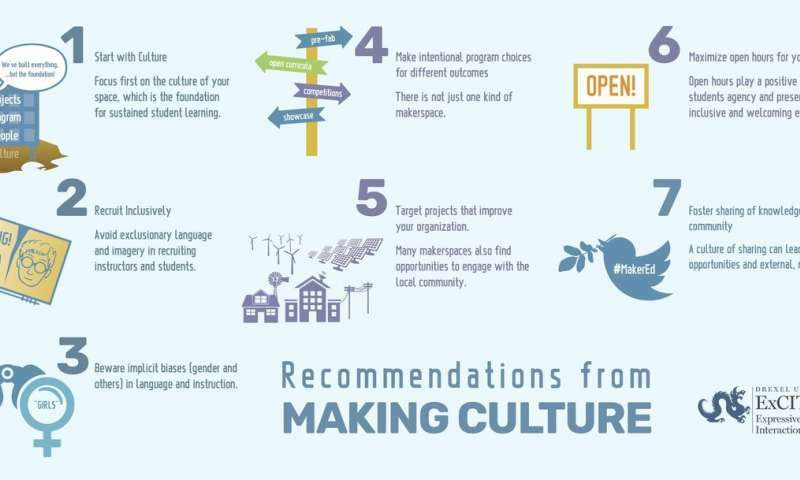 "The Making Culture report on education makerspaces is a fantastic resource for everyone grappling with the potentiality of changing how education is occurring and students are making sense of their world with authentic work. Not only does it identify potential 'rocks' in the stream it provides suggestions for thoughtful integration of this K-12 concept. Truly a useful guide for educational practitioners and leaders." said David Baugh, Ph.D., superintendent of the Centennial School District (Pennsylvania).